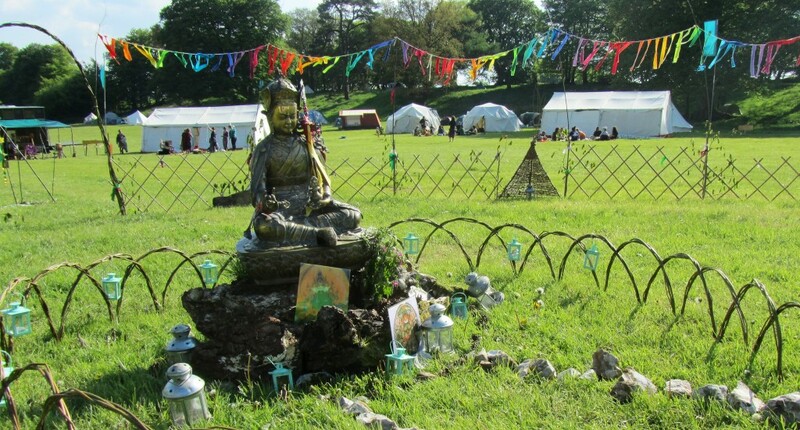 Where better to be on a sunny bank holiday weekend at the end of May [23—27; Green Earth Awakening Camp 2013] than in a field in the Blackdown Hills near Taunton with Buddhafield? About 150 people gathered together to share skills and inspiration for living a greener, more connected and more satisfying life. The gathering coincided with Wesak, the celebration of the Buddha’s enlightenment and a glorious full moon over the beautiful tree-lined fields. There was a spacious and varied programme of activities and workshops, meditation, ritual, talks, music, eating together, camp fire, sauna and sun bathing opportunities. From the many craft activities and workshops on offer I explored just a few. I was inspired by a talk on Permaculture, spent an absorbing morning carving a spoon from a beautiful piece of wood, then drew some energy from the earth to dance like a dakini. For me, one of the highlights was a talk by Akasati on The Wisdom of Letting Go Revealed in the Story of the Buddha’s Enlightenment. Akasati described how the soon-to-be Buddha, Gautama, had followed a path of deprivation and mortification of the body, before admitting that this approach was bringing him close to death rather than enlightenment. He let go of the status he had achieved amongst his fellow ascetics and instead sought another way. The story shows us, explained Akasati, that we too may do well to let go of ideas, attitudes or views of ourselves that no longer serve us well. This can be difficult, giving rise to fearfulness, but our practice can help us draw courage to change, and reinvent ourselves. Maybe I can start with letting go of small things in order to train myself for a larger letting go? Akasati explained that seeking awakening is about letting go of our experience of a divide between self and other. Lying on my back on the grass, gazing up at a blue sky, watching some birds high above, that divide dissolved away for a few moments. I can see the merit of living closer to the earth, away from the concrete and pavements of the city, enjoying the simple absorbing activity of shaping a piece of wood with a knife. Even if I haven’t let go enough yet to walk away from life and work in the city, I am deeply grateful to Buddhafield for giving me the experience of simple and connected living for a few days. This experience was even deeper for me on a Buddhafield retreat that I joined at the beginning of May, when we camped in the Ashdown forest in Sussex. After a week there I felt a strong connection with the trees and the many living beings in the forest, including my fellow retreatants and the ants. Back home in Norwich, I’m now looking forward to my next Buddhafield experience — the Buddhafield Festival from 17 to 21 July. I hope to see some of you there!